Description: Shrub to 1–2 m high, mostly glabrous, often with glaucous stems and rachises. 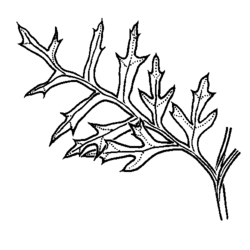 Leaves divided 1–4 times pinnately or 1–4-pinnatisect, 10–35 cm long; smallest segments linear or lanceolate, 3–20 mm wide, margins usually sharply toothed, ± glabrous, lower surface ± glaucous, sessile and decurrent. Conflorescences terminal, raceme-like or paniculate, 20–30 cm long, exceeding the leaves. Perianth c. 15 mm long, white, ± glabrous. Distribution and occurrence: Widespread in heath, sclerophyll forest and woodland, mainly on the coast and tablelands. Extremely variable taxon in the amount of dissection in the leaves, the size of the ultimate segments and the degree of glaucousness. In some New England populations it hybridizes with L. fraseri and with L.myricoides and L. ilicifolia in CC & CT.